Well – it’s time for some reflection on our part, while you are done with voting and busy with daily work. We trust you are the kind who will vote for a good candidate, not a traditional voter who will cling to a particular party all through your life. That’s why we put in hard work to compile a lot of data for you to decide which candidate is what. Let us confess: We are a small team. We don’t have the kind of manpower to chase each one of these candidates – still we feel we did our best. The chasing wasn’t easy. To get an appointment with Nandan Nilekani, we had to wait for a month.But he answered all our questions without censoring any of them. We thought he would be the busiest person. But our guess turned out wrong – we couldn’t even go near our ex-chief minister Sadananda Gowda and P C Mohan. And, Abdul Azeem was one more we couldn’t catch, as he had little time for us. Or were they? Weren’t they interviewed by every other media in town? Why not Citizen Matters? Well – look, we have a bad habit of asking some questions which no other media on town wants to ask. For example, we wanted to ask P C Mohan, why did you spend your MPLAD fund in Nelloor instead of Bangalore. With DVS, we wanted to ask will 70 lakhs be enough for an election campaign, and how does he plan to fund his campaign etc. Wouldn’t you, as a voter, be interested to know about all these aspects better, from the horses’ mouth itself? We do know it’s not easy for them to answer our simple questions. But we made the effort of asking them. They asked us to mail the questions. We did it sincerely. And they neither got back, nor made time for us – they were all busy. Ananth Kumar, BJP’s Bangalore South candidate, made some time for us in between his campaign. But, as we said, we could not let go of our habit. We asked an innocent question – or call it ignorant or foolish – which no other good media in town asked him. What is this HUDCO issue all about? Was that a scam at all? What happened exactly? We asked this because we wanted to know about the issue. There is very less material on the public domain on this issue. The CVC / CBI closure report on the issue isn’t made public. We don’t know what happened to Supreme Court’s direction, and the status. Kumar answered our question defensively, but did not mention the background of it. So when we published the interview, we added an editor’s note into the interview, which was based on the old news reports from 2002 to 2011 – all we could gather on internet. Well – once the interview was published, PA of Ananth Kumar calls us. Asks us why we have added editor’s note. We explain. He is insistent. He asks us to take the editor’s note off the page. We are puzzled. We are even accused of being partisan – which we explain, isn’t the truth. He hangs up the phone. He again calls after a minute and says it was all political vendetta, and there was no scam at all, there was no proof. If there was, UPA government wouldn’t have left Ananth Kumar. Exactly – we tell him – this is why we want to know his side of the story. But nothing is available publicly – it should be available at least on Ananth Kumar’s website. He says they had it on his website earlier, and can mail it to us for our reference. But we have to take the editor’s note from the interview. Reluctantly, we took the note off the interview. And we waited for a day. Multiple reminders in this regard did not serve any purpose! The promised explanation on HUDCO wasn’t sent. And the deal is off – we have our editor’s note back on the interview page. Another memorable experience is with Rajeev Chandrashekhar, independent Rajya Sabha MP from Bangalore. We wanted to know his views in detail, as he had endorsed Narendra Modi for Prime Minister. His office wanted us to send the interview questions. We jotted them down and sent it. Needless to say there were some hard questions here too. For example, we wanted to know what he would do if RSS starts ruling from back if Modi comes to power – does he support it. Or was he not aware of BJP’s development agenda which promotes industries. But we couldn’t get an appointment, for various reasons. We persisted, but ultimately Chandrasekhar’s travel schedule was too hectic we were told, and he couldn’t make time for us. Narayana Swamy, Bangalore North INC candidate, promised a face-to-face interview, but it not happen. Then in a late night interview over telephone, he answered some of our questions. answers to all our questions. Rizwan Arshad, Bangalore Central INC candidate, answered the questions without getting agitated. He explained his case, even when we probed the rumours about him rigging Youth Congress elections! 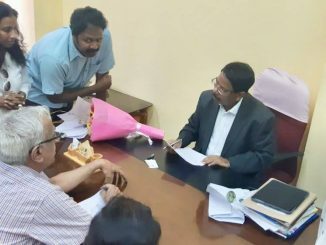 Overall, AAP candidates – V Balakrishnan, Babu Mathew and Nina Nayak, faced all questions without any hitch – probably because they did not have any baggage from the past to carry. Congress candidates were okay at taking questions, and did not require any censor board to clear our questions. You, the reader, must have understood why majority of newspapers or media never get deep into any issue – getting deep is suicidal many times – and is equivalent to getting stuck in uncomfortable situations. We could not cover Bangalore Rural and Chikballapur due to our own staffing (read: funding) limitations. If you have been reading Citizen Matters for some time now, you will know our approach to journalism well. Our reporting is public-funded, so we are answerable to you. We have done our best to be independent in our presentation of profiles, campaigns and interviews. Do give us your feedback! I would like to congratulate you for the interesting article. I really liked the probing questions part, though I must commend you for your guts. Thanks for bringing unbiased and a new style to journalism. Success of any social media ( print and electronic ) is depend upon its quality in reporting, the reader must feel that what has been reported or published is free from any influence that is without favour or fear . News should be first hand shouldn’t be offered with editors views . I have no hesitation to say that your magazine is inclined towards certain groups of people and mostly centric to their ideas and views the example are Loksatta party , BPAC , voice of local corporates to promote their views and their cult which may be good for their own interest but certainly not for entire Banglorians. Your article on Sri Ananth kumar and Chandrasekhar is not in good test , needs to be reviewed .